The department, today the department of machines construction technology (DMCT) was founded in 1964. The first Head of department was dr., assoc. prof. O. DERID (1964-1965). Along the way, the position of head of the Department were exercised by: E. DIBNER (1965-1968), dr., assoc. prof. V. GOLOGAN (1968-1969), dr., assoc. prof. E. SCHIOPU (1969-1971), dr., assoc. prof. V. ANTOSEAC (1971-1974), dr., assoc. prof. V. TIMOSCENCO (1974-1978, 1980-1987), dr., assoc. 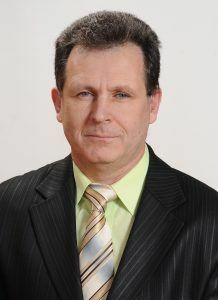 prof. A. CIOBANU (1978-1980), dr., assoc. prof. V. VISNEACOV (1987), dr. hab., univ. prof. B. SAUSCHIN (1987-1991), dr., assoc. prof. E. OJOG (1991-1993), dr., assoc. prof. A. TOCA (1993-2003), dr., assoc. prof. S. MAZURU (from 2003). The first professors who formed the teaching staff of the Department of MCT were: V. MUNTEANU, N. MARGINE, A. STANCIU, A. MARIN, V. LUCA, A. MOROSANU, V. UNGUREANU, A. CRACIUN, B. STIPELMAN and others. In 1965, some of the teachers headed by O. DERID formed The Department Technology of Metals, and in 1969 another part of the teaching staff, headed by V. GOLOGAN, formed The Department of Machine Tools and Tooling. Department provides training of engineers on specialties “Machine Construction Technology”, “Welding Engineering ” and ” Innovational Engineering and Technologic Transfer”. Since its establishment until now the specialties of the department were graduated by over 5,000 engineers, including reduced attendance section – 1132students (first promotion at the specialty MCT was in 1967 and at the specialty IETT – in 2008). Among graduates: Valeriu COSARCIUC – vice-prim-minister, parliamentary, Anatol TURCAN – Vice Mayor of Chisinau, Valeriu MUNTEANU – the prefect of Chisinau mun., Ion TANAS – Minister of Industry, Member of Parliament, Grigore TRIBOI – Minister of Industry, Vladimir DOBREA – Mayor of Chisinau, Member of Parliament; General Directors of JSC: Moldovahidromas – Nicolae SOFRONIE, Hidropompa – Ion MARTEA, CST Hidrotehnica – Dumitru CIBOTARI, TRACOM – Stanislav GALASANU, AviaTehnologia – Igor CURTEV, Floare Carpet – Nicolae RABII, most teachers of the Faculty of Engineering and Management in Machine Building – doctors habilitate, doctors, university professors, associate professors. 11 of the 13 teachers of the MCT Department are graduates of the Department (10 –MCT, 1 – IETT). 60 graduates have defended their PhD thesis. Systemic throughout the life cycle. The plans and modern study programs, quality education provides graduates ample opportunities for employment in Moldova and in Romania, Slovenia, Japan, Norway, Ireland, France, USA, Great Britain, Belgium, Russia, Ukraine, and Thailand etc. The members of the section have published over 150 didactic-methodical works, including 10 manuals and about 25 methodical guidance. Development of methods and processes mechanical deboning of gear teeth including the unconventional ones. During the last years the collaborators and PhD students of the department defended the 19 PhD theses in technique, 1 doctor habilitate thesis, published 8 monographs, over 1000 scientific papers, obtained about 180 invention patents and certificates. The DMCT has achieved 35 research projects included on the basis of economic contracts. Innovative Manufacturing Engineering (MTQR renewed series) – IManE editions of the years 2013 -2015. The Department has a laboratory of Scientific Researches, a Center for Computer Aided Design, 5 teaching laboratories equipped with technological equipment, switchgear, devices. The MCT department collaborates with sections and departments related to the Machine Construction Technology or similar from Technical University of Iasi, Cluj, Brasov, Bucharest, Suceava, Bacau and National Technical University of Donetsk (Ukraine). With colleagues from Iasi, the department organized alternately 17 editions of International Scientific Conference “MTQR” “ModTech”, “IMaN”. Within the program CEEPUS there were achieved mobility projects for teachers, doctoral students and students with the Technical University of Sofia (Bulgaria) in the 2011-2012 academic year and Koszalin Technological University (Poland) in the academic years 2012-2013, 2013-2014, 2014-2015, 2015-2016).